The 2019 World Economic Forum this week in Davos, Switzerland focuses on the theme of “Globalization 4.0.” This is an apt way to describe the change afoot in our highly interconnected world. Post-war international alliances are shifting, political norms are being upended and rapid technological change is disrupting industries and trade. Inequality has been rising amid stagnating median incomes. Social, political and cultural divides have widened. All this has eroded trust in the political and social systems of democratic societies, and inspired resentment and support for protectionist and nationalist agendas. Cyclical risks are rising as the expansion advances and financial conditions tighten. 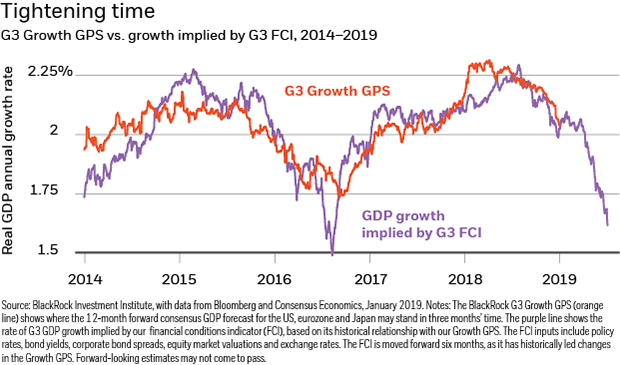 The U.S.-led economic cycle is entering a late phase, and markets have been adjusting to slower growth and tighter monetary policy. In addition, trade and technology frictions loom. All of this change brings higher uncertainty, and makes building resilience to uncertainty more important than ever. This is especially true in a portfolio context. The BlackRock Investment Institute aims to provide insights to help investors keep pace with, and create portfolios resilient to, these shifting dynamics. Here’s a look at three such insights we shared during our discussions in Davos. We view geopolitical risk as a material market factor in 2019, particularly amid slowing growth and rising uncertainty about the economic and corporate earnings outlook. Our barometer of overall market attention to geopolitics has edged down recently, enlarging the potential market impact of geopolitical shocks. 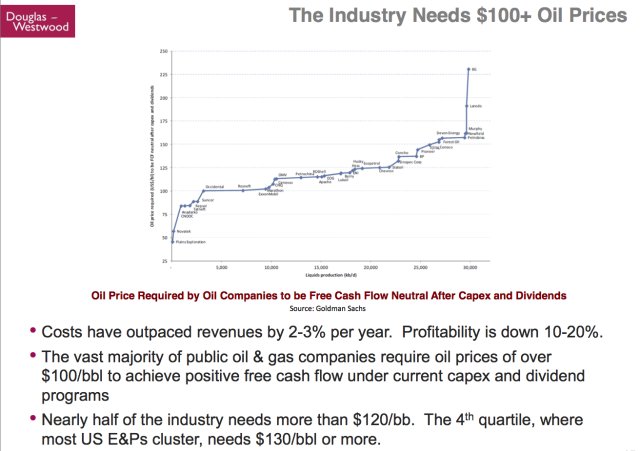 It’s the risks investors are not focused on that tend to have the greatest market impact, we find. 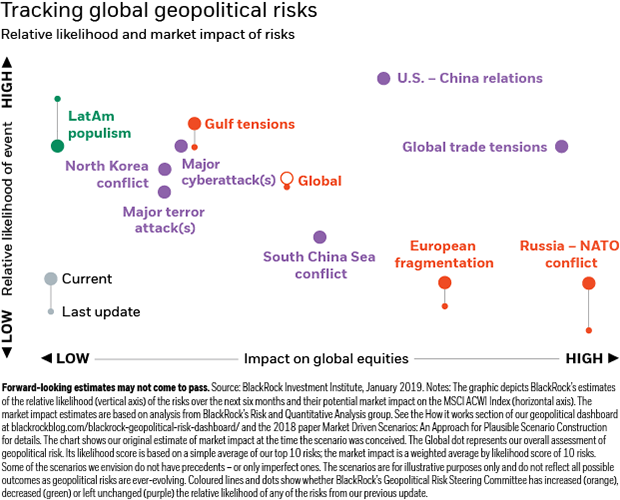 We have upgraded the likelihood of three of our top 10 geopolitical risks, even as overall market attention to geopolitics has shifted down. We see trade, U.S.-China relations and European political risks dominating this year. We see U.S.-led global growth slowing as the recovery from the Great Recession enters its final stage. The key drivers of the slowdown: elevated macro uncertainty, an intensifying U.S.-China tech rivalry and tighter financial conditions. See the Tightening time chart. Trade activity, business sentiment and investment plans have softened, while the fading U.S. fiscal boost should be offset by heftier stimulus in China and Europe. 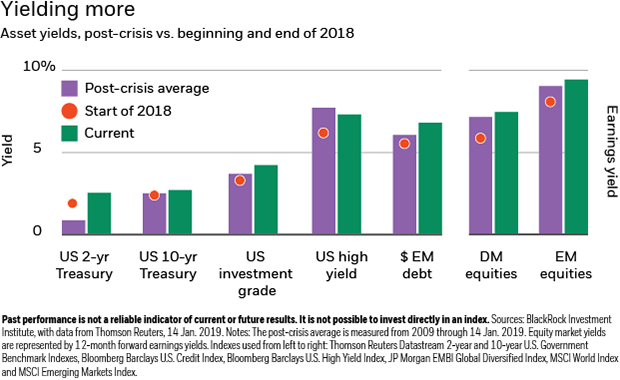 We see the risk of a U.S. recession as limited in 2019 and believe financial markets have priced in most of the downside risk. We see three key market themes for 2019. The first (“Growth slowdown”) acknowledges a slowdown in global growth, and increased uncertainty around the outlook. The second (“Nearing neutral”) highlights how U.S. interest rates are en route to neutral — the level at which monetary policy neither stimulates nor restricts growth – and how we expect the Federal Reserve to grow cautious as it nears neutral. The third theme (“Balancing risk and reward”) stresses the importance of building greater resilience into portfolios. As 2019 kicks off, we prefer stocks over bonds, but with reduced conviction versus 2018. Cheapened valuations lower the bar for positive performance this year, but rising risks argue for caution. Equity valuations are back in line with post-crisis averages, as gauged by earnings yields. See the Yielding more chart. 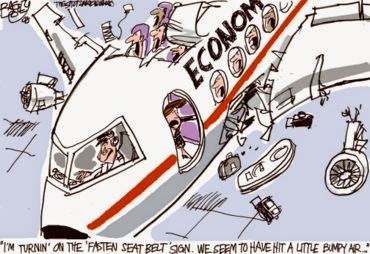 Yet fears over an economic slowdown, earnings downgrades and trade conflicts loom large. This underscores the need for resilience. Individuals, business leaders, investors and policymakers must build resilience to shifting political dynamics, regulatory landscapes, technological innovation and social attitudes. Some of these changes are predictable; some are not foreseeable. Being resilient means being agile and adaptive. Resilience requires either adjusting one’s approach in anticipation of a fore-casted change or reacting quickly when change, possibly foreseen, occurs. It requires different strategies for different time horizons. From a portfolio perspective, we advocate building in resilience via a bar-belled approach. This entails exposures to U.S. government debt as a portfolio buffer, twinned with high-conviction allocations to assets that offer attractive risk/return prospects, such as quality stocks and emerging market equities. 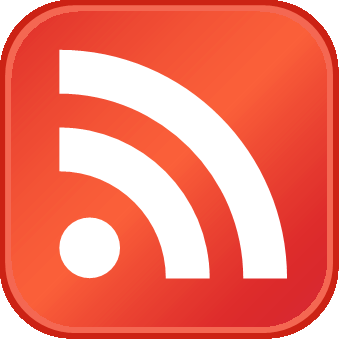 Courtesy of Philipp Hildebrand, BlackRock Vice Chairman, oversees the BlackRock Investment Institute.